Discover the buzzling young city in the comfort of your very own Berlin apartment! 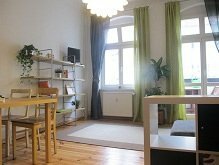 We offer four comfortable Berlin Apartments and Vacation Rentals ideal whether you’re visiting this interesting city for your holidays or passing by on a business trip. All apartments are furnished and fully equipped. From the small 480 square-foot-apartment for 2 or 4 guests to the big 1290 square-foot apartment for up to 8 guests, there is surely one that suits your needs. All apartments have a balcony for the smokers among our guests and are equipped with kitchen and TV. Electricity, water and heating are included in the rental. All apartments are maintained to a high standard, and some of them offer free high-speed internet connection over WiFi. The apartments are located in a beautiful neighborhood with a lot of wonderful restaurants, cafes, and boutiques for shopping. The nearest bus is only 20 metres away from the building, the nearest underground about 500 metres. All important parts of Berlin are within your reach. This 1290 square-foot apartment is located in the forst floor of the building and specially indicated for large families and gropus. In its two bedrooms it offers space for up to 8 guests. It has also a living room, a huge fully equipped sit-in-kitchen and a bathroom with tub. The price for this apartment starts at 75€ per night plus 40€ cleaning fee. If you plan to stay 2 nights with 2 adults, the cost would be 190€; the cost for 3 nights is 265€, including linen, towels and cleaning fee. Please consult other price calculations on the page for this apartment. Our 1070sqf apartment in the third floor of the front building is suitable for up to 6 guests. Thanks to the two large bedrooms (270sqf and 355sqf) and a fully equipped sit-in-kitchen, this apartment in Berlin Friedrichshain is specially indicated for families. You will find books in several languages, games and a flat-panel television with USB port. A fast WiFi connection is included in the rental price, and also utilities (water, heat and elictricity), linen and towels. The balcony with views over the green Boxhagener Platz is wonderful for the smokers among our guests, as smoking is not allowed inside the apartment. If you plan to stay longer, you will appreciate the washing machine in the apartment and if it is rainy also the dryer in the basement of the building. The price of this apartment in Berlin starts at 80€ per night for a minimum of 3 nights. The cosy apartment Anna offers views over Gärtnerstrasse and Boxhagener Platz. Its 480 suare feet include a bedroom with a double bed (200cm x 160cm, enough space for a foldable children bed is available) and a big living room with kitchen unit, table, sofa-bed for up to 2 guests, preferrably children (200cm x 160cm) and flat panel television with USB connection. The balcony is ideal for smokers and has also a foldable table and two chairs, so that on sunny days our guests can take their breakfast there. The apartment also has a wide entry hall and a typical bathroom with shower. The kitchen unit is functional and includes all what you need for normal cooking. There is a fridge, a toaster, a kettle and a coffee machine. The rental includes utilities, WiFi, towels and linen. All three apartments are located in a corner building at Boxhagener Platz, Berlin, Germany. The neighbourhood, Friedrichshain, is the new heart of the city. Here you'll find the last long piece of The Wall and an intensive alternative cultural live. All apartments have been recently refurbished. The neighbourhood is quite young and dynamic. There are many cafés, restaurants and shops in the immediate surroundings. The apartments are perfectly communicated by public transport; you have two undergrounds nearby, one of them at only 500 metres, several bus lines and street-car lines. 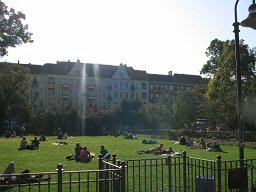 In about 15 minutes you'll reach Prenzlauer Berg, the centre of Kreuzberg, the Museums-Insel or Alexanderplatz. If you are interested in Berlins night-life and modern music, www.tresorberlin.de is your place. Should you still need a flight, you can try at Air Berlin or Easyjet. If you are interested in one of our apartments, please let us know. You can send directly an email to ostrunk(at)ostrunk.de ore use our contact form. Make sure to check the list of important events in Berlin to find your accommodation in time. You can also contact us if you are interested in our traditional cottage Finca Alzinar near Artà, Mallorca.